Mislav Radic is a Ph.D. Fellow at Cass Business School, City, University of London. In his research he is broadly interested in the interrelations between strategy, identity/culture and social issues, in times of change. For his PhD dissertation, he is studying how the process of privatization influences changes in an organizations identity and culture. Mislav has researched/worked with a number of private and public sector organizations including the Royal Mail, the World Economic Forum, the Croatian Postal Bank and the Croatian National Foundation for Civil Society. 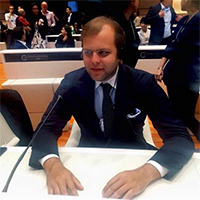 Other than academic research, Mislav is an active member of the World Economic Forum's Global Shapers community through which he has worked on various social entrepreneurship projects. Croatian (can read, write, speak, understand spoken and peer review), English (can read, write, speak, understand spoken and peer review) and Italian (can read, write, speak and understand spoken). 78th Academy of Management Conference. (Conference) Chicago, IL, USA (2018). Session/Day Chair and Organising Committee.